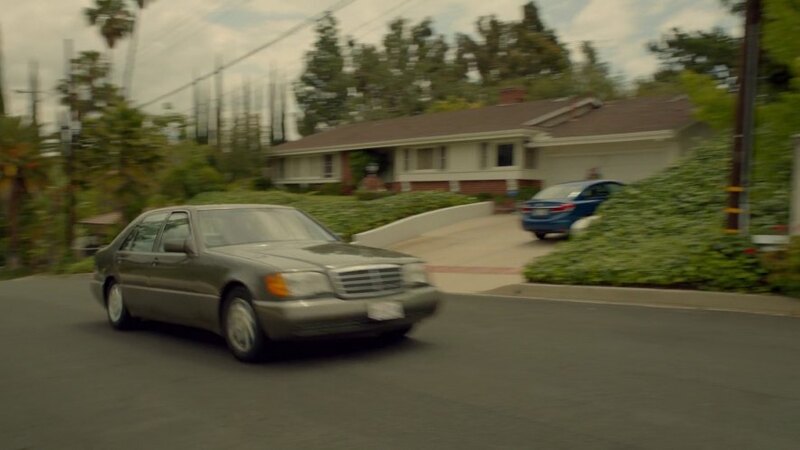 IMCDb.org: 1994 Mercedes-Benz S 500 [W140] in "American Crime Story, 2016"
I remember in one of the shots I saw an S500 badge on the trunk. These were 1991-1993 with these headlights I believe. Also a completely anachronistic 2013-2015 Honda Civic (blue car) in the background. It's indeed a S500 from CVS: Link to "cinemavehicles.com"
Confirmed to be a 1994 model by the plate. Makes sense for John Travolta's character (Robert Shapiro) in my opinion. Although Travolta drives a W140 in this show, the real Shapiro drove a black W126 during the trial. Maybe he also had a W140, but what I've seen on pictures of 1994/1995 it was a black W126 with Shapiro behind the wheels.